Word is on the street; the platform has a new name: SAP Cloud Platform (see Press Release). During the last couple of years it got obvious that many people new to the platform primarily associated the name SAP HANA Cloud Platform with SAP HANA being offered in a cloud environment (see Forget HANA. Forget cloud. Let’s talk platform!). And while that is certainly true, it is only one aspect of SAP’s cloud platform offering and as such it falls short to frame the big picture. During the last five years the product evolved into a comprehensive platform-as-a-service offering that simplifies the development and operation of new cloud applications and building extensions for existing SAP solutions, both on-premise and Software-as-a-Service (SaaS). It has become the designated extension and integration platform for SAP’s entire portfolio and the technical foundation for a whole set of new applications and entire new product lines evolving around Internet of Things (IoT), machine learning and others (more on that later). In short: it became the central piece of SAP’s technology platform in the age of digital transformation. 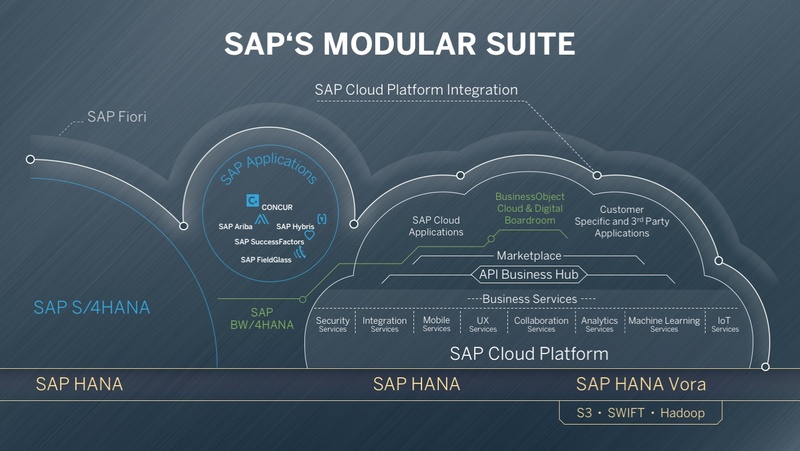 In that context it is plain to see that the role of SAP Cloud Platform is certainly more nuanced and of much broader strategic significance than just offering SAP HANA in the cloud and that its strategic role in integration and extension scenarios has been something that was not quite reflected in its name; hence the name change. The new name clearly addresses that this is THE cloud platform of choice for every company determined to streamline and reinvent their core business processes with S/4HANA and embrace the new capabilities that arise with IoT, Big Data and machine learning. Existing Business Suite customers benefit from the vast integration capabilities provided by the platform and can use it to build extensions that connect to backend systems and SaaS solutions alike. The new name says it all and certainly addresses the much broader role the platform plays… and there’s plenty of exciting news to come this year! Yet, before we dig deeper, let’s quickly reiterate on the general value proposition of a cloud platform offering in order to put the new topics into perspective. In the context of digital transformation, basically every company becomes a more and more software-driven company (see Why software is eating the world by Marc Andreessen). Generally speaking, every company needs to cater to two needs: ensure smooth operations of core business processes (non-differentiating) and to be able to quickly roll-out new innovative software solutions to gain/maintain a competitive edge. This concept has been labelled bimodal IT or IT pace-layering by Gartner and others – see In the Digital World CIOs Need Bimodal IT: Rock Solid IT with Ability for Fluidity. Within that context, Mode 1 refers to streamlining the core business processes based on standardised software and leveraging the real-time insights gained by analytics to optimise how a company is run. Mode 2 focuses on business innovation and lowering the time-to-market to roll-out custom-built, differentiating cloud applications. SAP Cloud Platform plays a key role in that concept as it allows to literally out-source extensions and needed customisations instead of addressing them directly in the core backend systems. That way, companies avoid the problem of picking up technical debt over time that results in hard-to-maintain, hard-to-upgrade backend systems as seen in the past. As said before, the new name is only the beginning and there are several key topics on the agenda for this year. In terms of technical capabilities being added to the platform the man focus is on IoT (SAP Leonardo), big data scenarios and machine learning (SAP Clea). You have probably heard that SAP plans a multl-billion investment over the next five years (see SAP IoT Connects the World to Enable Live Business). On the big data front SAP has made a strategic acquisition buying Altiscale last year and the merits of the gained expertise will show this year. Another hot topic in 2017 will be machine learning and SAP has established a brand-new product line called SAP Clea that aims to deliver a constant stream of smart software solutions powered by machine learning. Last, but not least (the opposite in fact), is the area of business services. SAP is determined to go beyond just delivering a general-purpose platform-as-a-service offering, but rather establish a digital enterprise platform. As such, the SAP Cloud Platform will constantly be enriched with higher-level services that deliver business functionality as microservices. Those services will of course leverage the afore mentioned technologies such as big data processing and machine learning. So, let me be the first to say so explicitly: 2017 will be *BIG* for @saphcp! Exciting times ahead – stay tuned! Clear & crisp! Amazing job, as always Matthias!! Thanks Manju – happy to hear you find it useful! Now the fun part begins – plenty of conversations to have on Twitter etc. thank you for the blog. Nice that you share it right before all the complaining about renaming begin to get big. Happy to hear that – yes, the new handle is pretty nifty! Well Explained Matthias..thanks a ton. Good read. So what is the official abbreviation for SAP Cloud Platform? safe to assume SCP? I think the abbreviation would be SAP CP. There is another SAP solution “Supply Chain Planning” which is being referred to as SCP. Thanks for sharing, Matthias, and for providing all the insights and details around the big picture! Well explained Matthias. Thanks for sharing this. Thanks for sharing, Matthias, so HCP –> SAP CP now. How about HEC & HCI? Are they going to be rebranded as well (something like SAP ECP & SAP ICP)? SAP HCP integration services aka HCI is already renamed to SAP Cloud Platform Integration. Right, HCI is part of the family and all services will follow the same naming pattern. thank you for the blog Matthias – well explained and very informative. very useful and clear, thanks! Thanks for sharing, it’s SAP Cloud Platform, new name, new dimension. For the broad transformation of Cloud Platform. Great post! 2019 and I still find this extremely useful. Thank you.